Inazuma Eleven is actually a DS game in disguise, developed by Level-5 and released in Japan in late 2008. However, in last week's Nintendo Direct presentation, Nintendo announced the game was being localized, and it was released in the North American 3DS eshop immediately after the presentation. I'm always intrigued by these weird genre combinations, so I picked it up and gave it a shot (no pun intended). Your character is Mark Evans, the captain of a junior high school's soccer club. The club is lazy, unmotivated, and disrespected, and there aren't even enough members to field a team. Shortly after the game starts, you find a few stragglers across the school grounds (which are pretty huge for a middle school, to be honest) to play against a rival school, which serves as the game's tutorial. The plot is lacking in...well, a lot of areas. 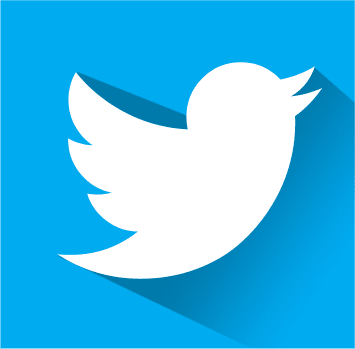 The characters vary on a large spectrum, but what those characters do is pretty predictable and boring. There are certain events that stand out in my mind as at least notable, but overall, the plot is a fairly generic one, with morals of "holding on to hope!" and "always believing in yourself and your friends!" It most likely won't take anything away from the experience, but it certainly doesn't add anything on top of the addicting gameplay. The game is split into two distinct gameplay parts: One is the RPG, where you walk around, talk to other students/faculty/people in the town and progress the storyline. You can also buy different items for your players, rematch schools that you've already faced, and recruit new players for your team (this last one is a very intricate recruitment system; you'll read more about it below). 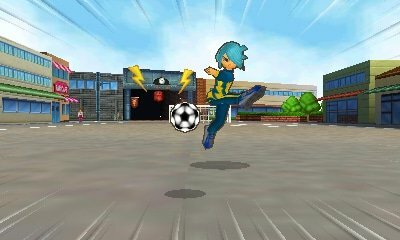 You can also run into random soccer battles with other clubs at the school, which gives your team experience to level up. There's minimal grinding in Inazuma; as long as you keep the TP (energy) of your players up, any stat deficiencies can be made up for with skill when in a match. This is deadly important in an RPG, as the grind kills a lot of games in this genre, but not Inazuma Eleven. The other part is the soccer battles/matches. The player moves members of their team around on the touch screen, using taps to pass to teammates, shoot, and challenge the opposition. When you collide with an opponent who has the ball (or vice versa), a mini-battle is engaged where you can choose between two options to steal or keep the ball. The success rate is determined by the character's skill levels in seven different stats, and if they have backup from other teammates. There are also some hilariously awesome special abilities you can use, like the Phantom Shot, where the ball dissipates in mid-air only to reappear near the goalie. 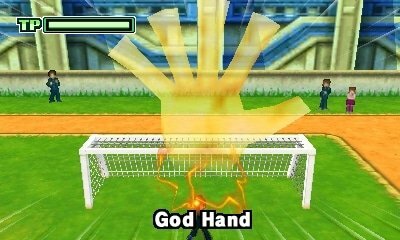 Or the God Hand, which lets a goalkeeper spawn a giant ethereal hand to catch the ball with. These moves are some of the best parts of the game, just in aesthetic appeal. The recruitment system reminds me a lot of the pin system in Square Enix's The World Ends With You: On the surface, it's easy to use and you don't need to delve deep into it to beat the game, but if you do, you're rewarded with multiple options to get access to over a thousand different characters. You can search by position, club, school, and a whole slew of things. There's also an option called the "Connection Map" that unlocks people based on how far into the game you are. Once you recruit someone, you find them somewhere in the city, play a short battle, and they'll be on your roster. There is an option for multiplayer, as well. The only option is quick matches and player trades between local systems, but that's still something. It's fun to compare teams with your friends, and the recruitment system gives enough variety between teams that it won't get stale if you really want to get serious about competition. Internet play would be nice, but I don't think we should expect it from games that are six years old. I've put about 10 hours into Inazuma Eleven so far, and I still find myself purposely walking around for soccer battles, replaying old teams, and recruiting new teammates. The meta-game in this has so much depth and importance that it takes a lot to get bored of it, as long as you enjoy the soccer part. There's also a training facility that unlocks once you get to a certain part in the game, which is great for those who love to power level. Even with some dry parts, the way this game's elements combine is fantastic, and it makes the game run with top efficiency. There's still quite a lot to do in the endgame, and even the full price is definitely a bargain. I hope to see more RPGs (Western or otherwise) that break the mold and integrate genres that nobody would expect to combine well. This is something that all gamers should explore, as it opens the door to other "bizarre" games. If you have a 3DS, Inazuma Eleven is a must-buy.